Mount Mercy Academy hosted its annual induction at the Mercy Center Convent Chapel. 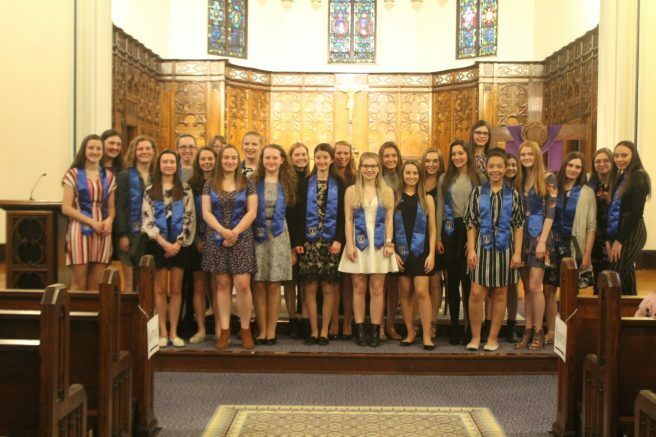 On Thursday, April 4, the McAuley Chapter of National Honor Society (NHS) at Mount Mercy Academy hosted its annual induction at the Mercy Center Convent Chapel. One senior and 24 new junior members were inducted, joining 27 previously inducted members. Membership in the National Honor Society is based on excellence in knowledge, scholarship, leadership, service and character. The National Honor Society was started in 1921 and there are over 20,000 chapters worldwide. The induction was attended by faculty, parents, relatives, friends and Mount Mercy President Margaret M. Cronin. The senior NHS members who were installed in 2018 explained the history of National Honor Society and what the five pillars of NHS mean. Co-moderator Amy Zawadzki presented the candidates for membership and Principal Margaret Staszak draped NHS stoles on the inductees. Caitlin Pautz Simson of Buffalo, a member of Mount Mercy’s Class of 2006 and a past NHS member, was the guest speaker for the evening. Simson graduated from Ithaca College where she received her bachelor’s degree in Clinical Health Studies in 2010 and a Doctorate of Physical Therapy in 2012. Simson currently works as a pediatric physical therapist at the Cantalician Center in Depew. Four juniors from Orchard Park — Kathleen Hughes, Jillian Kotwica, Olivia Larson and Evelyn Nowak — were also inducted. Six juniors from West Seneca — Hannah Dierolf, Grace Harrington, Allysyn Pajek, Jenna Shalloe, Bridget Whelan and Hope Willert — also were inducted into the McAuley Chapter of National Honor Society. Juniors Madelyn DiGiore, Chloe McHugh-Freedenberg and Olivia Seifert, all of Lakeview, were also made members of NHS. Be the first to comment on "McAuley NHS Chapter inducts 25 new members"